This pressure washer is ideal for cleaning driveways, building exteriors, animal pens, parking lots, and paint preparation. It comes with four quick-connect nozzles allowing you to choose the correct angle for your intended cleaning application. It also has a chemical injector to allow you to clean with soap. Clean up to 200 square feet, in fifteen minutes, with this cold water pressure washer. This unit is powered by a PowerEase 6HP gas engine and a light-industrial AR pump, and includes a 25ft high pressure hose and spray gun. 2700 PSI maximum pressure, 2.3 GPM maximum flow. Powered by a light-industrial PowerEase 6HP engine. Light-industrial axial pump is a 2.3 GPM pump for maximum cleaning. Quick connect spray nozzles comes in 40° , and soaper for use with a range of projects and cleaning solutions. Includes a 25 foot high pressure hose with quick connect fittings. The hose is kink and burn resistant. Comes with a industrial-grade high pressure spray gun and fixed chemical injector. This product comes with a 1 year warranty for normal use when not commercially used on pump, 3 year on engine and 90 days on everything else. Call 1-866-850-6662 for full warranty details. Powerplay Terrex 4000 is built using best-in-class components that can withstand rugged use from any dirty job you throw its way. Putting the muscle behind the name with Honda's GX390 Horizontal Shaft Engine and Annovi-Reverberi High Pressure Triplex pump delivering a flow rate of 4.5 GPM. Engineered for comfort and stability thanks to our anti-vibration system (PAVS), the ergonomic design includes a premium welded roll cage frame, oversized 12x3 wheels for great maneuverability. Terrex can handle any cleaning job from siding and windows to stripping paint or power washing vehicles. Our machines are built to out perform and outlast the competition. 2700 PSI 2.3 GPM Gas Pressure Washer This pressure washer is ideal for cleaning driveways, building exteriors, animal pens, parking lots, and paint preparation. It comes with four quick-connect nozzles allowing you to choose the correct angle for your intended cleaning application. It also has a chemical injector to allow you to clean with soap. Clean up to 200 square feet, in fifteen minutes, with this cold water pressure washer. This unit is powered by a PowerEase 6HP gas engine and a light-industrial AR pump, and includes a 25ft high pressure hose and spray gun. 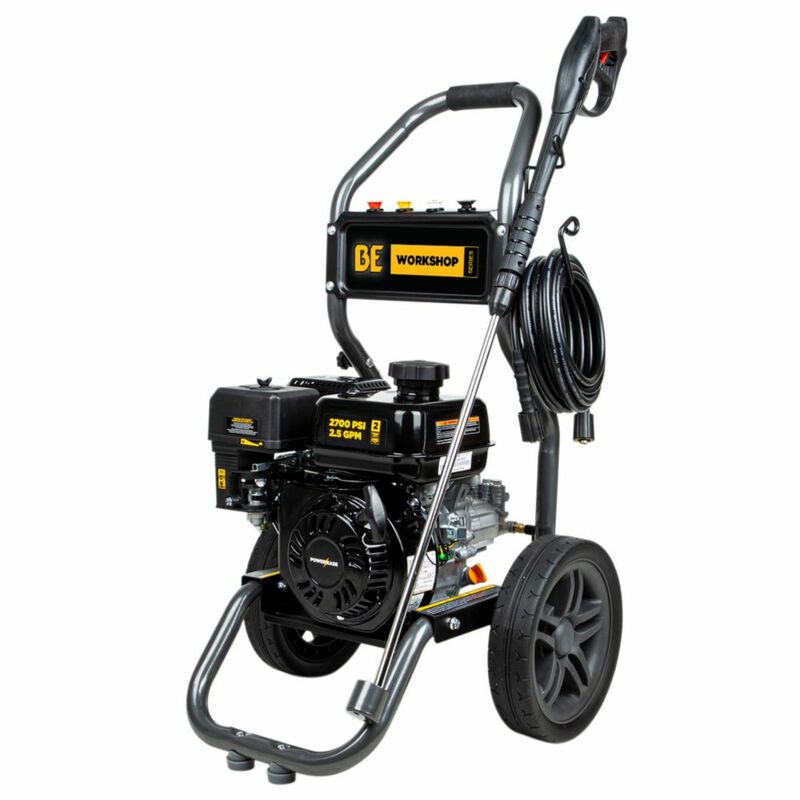 2700 PSI 2.3 GPM Gas Pressure Washer is rated 3.4 out of 5 by 9. Rated 5 out of 5 by Don2019 from Customer support I recently purchased a BE gas pressure washer and after reading the operation manual had a few questions so I called the BE toll free phone number. I was floored at how helpful the BE tech I spoke to was. He spent over 40 minutes on the phone explaining how the pump works, giving maintanence tips and how to prolong the life of the pump(don't leave the engine running with the sprayer not being used). It was simply great customer service and its nice to have someone knowlegable to call in case you have question or problem. Rated 2 out of 5 by Sam4555 from Great but bad assembly..needed reassembling I bought this a month ago however when I received it . I noticed that i could not hook pressure hose to pump as the unit handle rod was directly in center of the hose connector . I ended up unscrewing 4 findition bolts at bottom and remove engine/pump and slide it to the very back to connect water and pressure hose( took me 2-3 hours) Hope i get some rebate due to the effort i spent!!! Rated 1 out of 5 by Fred from Beware My experience is that this company will not stand by its product. It is inexpensive because it is made with disposable parts and is more expensive to repair than it is worth. If you have any problems be prepared to toss it out as the manufacturer will likely deny any waranty request and you will be left with a chunk of metal that is of no value to you. Rated 2 out of 5 by cook47 from parts missing Never noticed until I was working with the machine that there is no attachment for adding soap to the spray. Otherwise it works well. Rated 5 out of 5 by Rick74 from Love It! Purchased in May of 2018. Great features, great price. When you're shopping for a pressure washer you need to look at GPM over psi. Pressure is nothing without water volume. This unit has everything you need for home maintenance jobs. The soap pick-up is a real bonus feature for a pressure washer at this price. 4 nozzles included, easy set-up, good quality. I would definitely recommend this unit . I'm glad I bought it. Rated 1 out of 5 by Mike from Wasted Money Just barely 4 months old and used 8 times, gun seal breaks and water goes through all the time , so when I called the warranty center I was told to buy a new one as it only has a 90 day warranty! Didn't care it was hardly used! Rated 5 out of 5 by Captain Al from Cleans better than expected I purchased this to clean my boats off during the seasonal haul outside. Works extremely well on the bottom growth and barnacles. How much is theBE276RA Fuel Tank Capacity (gallons)? I love my new pressure washer. I have had it for 6 months and fires right up every time. Question, can I connect hot water to this machine? Hi there Big Al, Unfortunately you can not connect hot water to this unit the pump will overheat, the pump lubricate with cold water. I love this pressure washer. However, I have tried several times to get the washer fluid to run through the hose with no success. I have only tried the black soaker nozzle. any suggestions? Thanks BE for a quick reply to the soap dispenser not working. I have disconnected the tube from the 90 degree black plastic thermal overload and reconnected to the brass fitting as described, works great! Just a quick note on this subject, that hose was connected to black plastic right out of the box. Others nay encounter same problem! But now it works great and would highly recommend this to anyone. A great value! I was disappointed that there was not a mounted washer tank. Can I purchase o e separately?